Steam Curing Plants are generally suitable for Higher Production Requirements where investment is high (when compared with Water Curing), Production Cost is Less, Labour is Less and Curing by Steam only for 8 Hours. 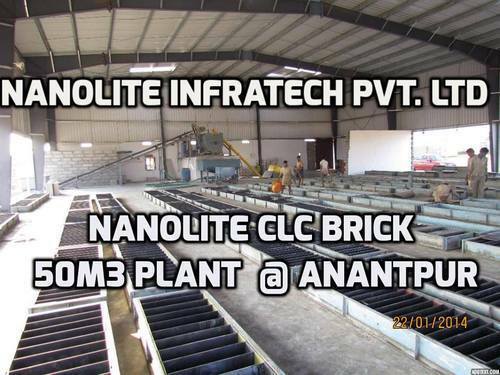 Nanolite through its continuous R & D, has developed latest equipment's with reduced Investment & Labor and provides scope to run the plant for 2 shifts a day without any additional investment through WIRE CUTTING MACHINE For BATTERY MOLDS (Quotes sent on Request). We owe our leading position in the CLC / FOAM CONCRETE to its strong focus on Quality Control. This focus has driven the Company to set up world-class manufacturing units with state-of-the-art technology. Every stage of Product Evolution, Design, Development, Manufacturing, Assembly and Quality Control is carried out meticulously. We take the pleasure of introducing ourselves as the Pioneer & the Leading manufacturer of Cellular Light Weight Concrete (CLC) / Foam Concrete – Light Weight Bricks Making Machines. We set up CLC Plants (Steam Curing & Water Curing) ranging from 10 m3 to 250 m3 with very less investment and in a very short span. Nanolite Infratech was established in the year of 2007 and has set up more than 270 units in almost all the states of India & Aboard. We are well known for our Quality Products, On-Time delivery, Execution of Turn-Key Projects & Competitive Prices in both National & International Markets.